Y Bont - be featured in our Summer Edition! Have you seen the latest edition of Y Bont? Download your copy here. We are preparing our Summer edition in a just a few weeks. 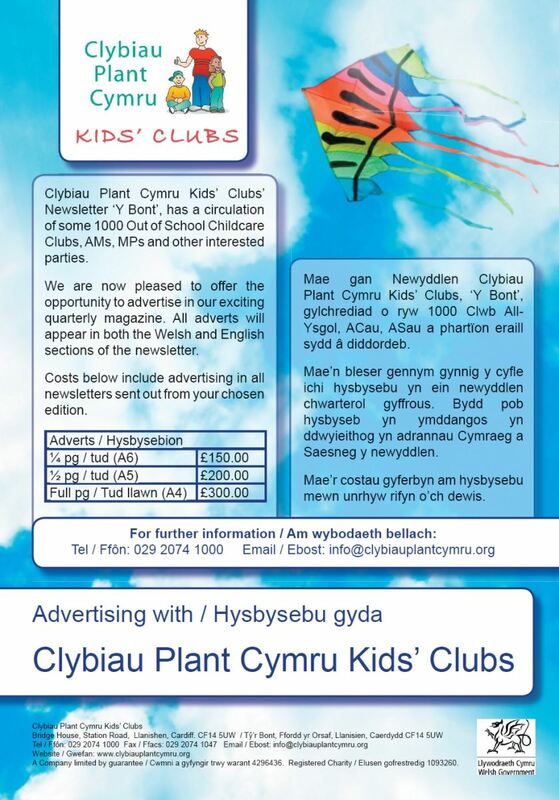 If you are an Out of School Club and would like to be included, you can send us your News, examples of good practice, activity ideas, photographs (with permission to use them) or case studies / stories to membership@clybiauplantcymru.org We would love to feature you in a future edition, and it is FREE advertising for your Club! If you would like to take out an advert, prices start at just £150.00 (for 2 x quarter page adverts – one in in English and one in Welsh). The price includes design, translation and circulation to Out of School Childcare Clubs across Wales, Assembly Members, Members of Parliament and other organisations, as well as being included on our website electronically. Please contact us for more details. Sign up for Y Bont!